The BFA are delighted to introduce the UK Team for the 2016 Individual AIDA Pool World Championship in Turku, Finland (www.aidafinland.org). The competition will run from 25th June to 3rd July and we are sending a team of 5 athletes, two of whom hold Wild Cards* (which means they ranked top ten in the world for one or more of the three pool competition disciplines), they are: Alice Hickson*, Georgina Miller*, Lucelle Simms, for the women and Philip Fennell and Mark Gooding for the men. Also, Andy Jardine is taking up an important role of the team coach and captain for the event. 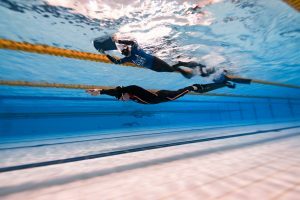 Last year’s World Championships in Belgrade saw Alice win two medals (gold in Dynamic No Fins and bronze in Static) and other UK athletes qualify for the final stages of the event. The BFA is confident this year’s team will perform to the best of their abilities and we wish them well. The UK Team are all self-funded and to help them perform their very best they are being generously supported by Divesangha (www.divesangha.com). Divesangha (www.divesangha.com) is made up of designers based in London; they are motivated by passion, uniqueness, innovation and a love for the sea. The word “sangha” means “association” or “community” in Pali and Sanskrit. They design and create basic, easy to wear clothes that give divers a proper identity. They call it “divewear” or “surface gear” and the designs mix fashion and sportswear, using functional fabrics and neutral colours. They manufacture ethically and locally, trade fairly, design wisely and consume responsibly. The divewear clothes are made in the UK as an exclusive, limited edition and they don’t use any plastic bags in their packaging when you buy from the website. This is the first time that Divesangha have sponsored the UK Team, we are delighted to have them on-board and the athletes will be proud to wear their surface gear! Would you like to sponsor the UK Team? If so please visit our website for more information, or contact our Sponsorship Officer Jay Cluskey: sponsorship@britishfreediving.orgThe BFA are delighted to introduce the UK Team for the 2016 Individual AIDA Pool World Championship in Turku, Finland (www.aidafinland.org). The Great Northern looked and felt a little different this year, being held on one day with two disciplines in the 25m pool, however athletes from the UK and Europe flocked to this friendly event with enthusiasm, with the promise of displaying some impressive performances. We were not let down. The UK male winner was Adam Drzazga from Blue Water freediving club with two strong performances; a huge 7.18 STA and 154m DYN. Coming in second for the Brits was Steven Tasker with 135m DYN and 4.59 STA and very close in third Paul Butterworth, with 5.02 STA and 132m DYN, both from the local Apneists UK club. Notably both Steven and Paul swam in bi-fins rather than the usual monofin. In first place for International male was also Adam Drzazga. Coming in second with an impressive performance was Aristo Vounakis from Apnea Revolution club with 5.27 STA and 130m DNF, and Marco Piccioni in third place with 113m DNF and 5.47 STA. Eoin Clarke set an Irish National Record in his dynamic swim of 117m DNF. The UK female winner was Alice Hickson, last year’s Newbie Award winner and also DNF World Champion in 2015, with a solid 130m DNF and 6:33 STA. 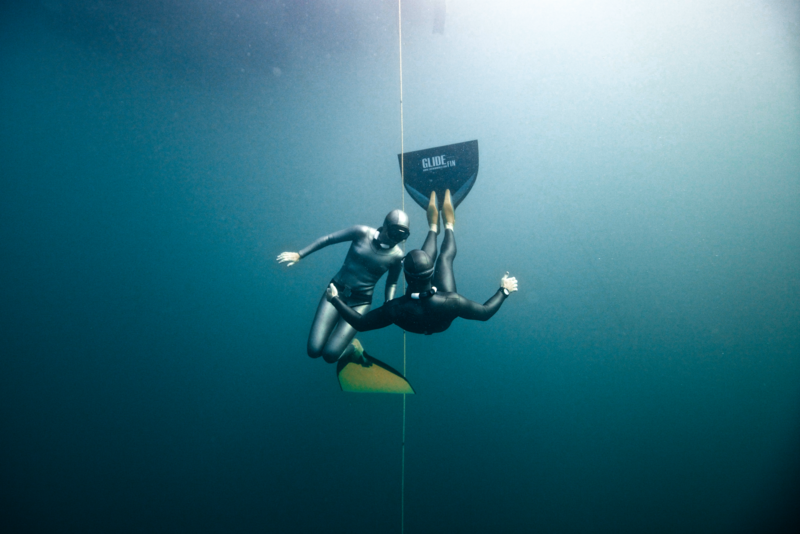 Alice trains with the Bristol Freedivers club along with Rose Van-Gowler who came second with a 3.39 STA and 68m DNF. In third place with a 2.31 STA and 70m DYN was Kate Goodwin. 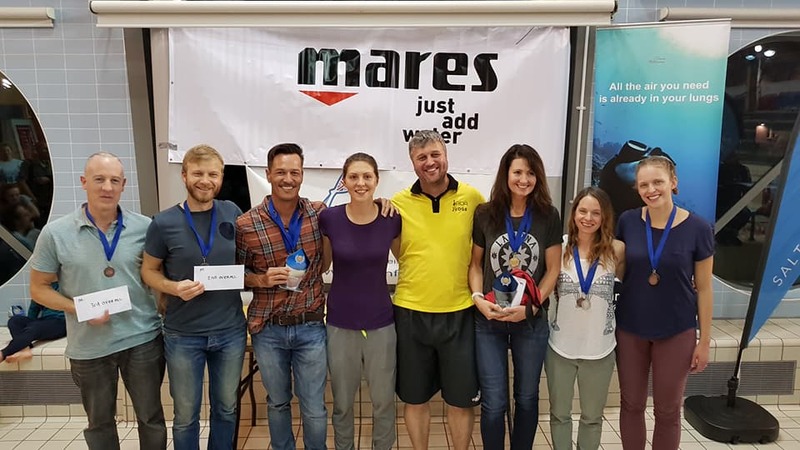 Alice also took the top prize for International female, with Go Freediving Club’s Delphine Brise from France in second, swimming 115m DYN and 3.23 STA and Rose Van-Gowler in third. Camilla Argent set an Irish National Record for the ladies, swimming 80m Dynamic.The winners of the Newbie Awards were Delphine Brise and Phillip Fennell. The Great Northern is a competition that celebrates achievements both in the pool and the hard training effort it takes to get there. It recognizes that freediving is not always about numbers and times but about personal achievements and obstacles overcome. Sometimes dives won’t go as planned and it shows the true strength of an athlete to learn from their experience and come back stronger next time. The sense of atmosphere at this year’s competition spoke volumes, with athletes from clubs all over the UK and indeed the world, coaching, congratulating and celebrating personal bests with genuine enthusiasm. The official kit sponsors were: Omer Breathless Emotions (http://www.omersub.com/), part of the Aqua Sphere UK and Aqua Lung UK family, Blue Orb (http://www.blue-orb.uk/) and the British Freediving Association (www.britishfreediving.org). If you are interested in competing for the UK in Finland, please let us know by 15th March. Please send an email to competitions@britishfreediving.org listing your highest AIDA ranked performances since September 15th 2014 in Dynamic with fins (DYN), Dynamic without fins (DNF) and Static apnea (STA) with details of where this ranking was obtained. If you do not have a ranked performance in any or all of these disciplines, please let us know your current best performances in training, and when you anticipate seeing those ratified officially. If you anticipate achieving a higher ranked performance in any of the disciplines in the next few months, please also let us know that in your email. If your geographical location makes it difficult for you to gain a ranked performance, please let us know and we will take this into consideration. If you are interested in going to Finland as Team Captain/Coach, please let us know you are interested by letting us know your experience in this area, and why you think you would be good for the job. Applications for the Team Captain/Coach position will be considered by the team once they have been selected, and appointed within one month of final team selection. If you make the decision to apply for the 2016 team, you need to be available in Finland for the dates above.The BFA will be doing all it can to gather sponsorship and logistical support for the 2016 team. However, you also need to be sure you can afford your flights and expenses and the entry fee of 350Euros and accommodation costs.